UPDATED: Wed., Oct. 18, 2017, 4:45 p.m.
INDIANAPOLIS – Greg Pence, one of Mike Pence’s older brothers, launched a campaign Wednesday for the eastern Indiana congressional seat that the vice president and former governor represented for 12 years. Pence, who once ran the family’s now-bankrupt chain of Tobacco Road convenience stores, previously said he had been courted to run for the overwhelmingly Republican district. It covers a broad swath of central and southeastern Indiana, including Muncie and Columbus. The district’s current congressman, Republican Luke Messer, is running for Senate. As the vice president’s brother, Pence is likely the hands-down favorite to win. He has a famous name, served in the Marines, owns an antiques business in the area and even bears a striking resemblance to his brother, with a close-cropped head of white hair. It’s likely he will also be able to tap into the same fundraising network his brother enjoyed in Indiana – if not nationally. An IRS document for Greg Pence’s political organization lists Craig Kunkle as its “custodian.” Kunkle is chief operating officer of a firm called MO Strategies, which is led by the vice president’s longtime aide and fundraiser Marty Obst, according to records kept by the Indiana Secretary of State’s office. A spokesman for Greg Pence declined to comment Wednesday. 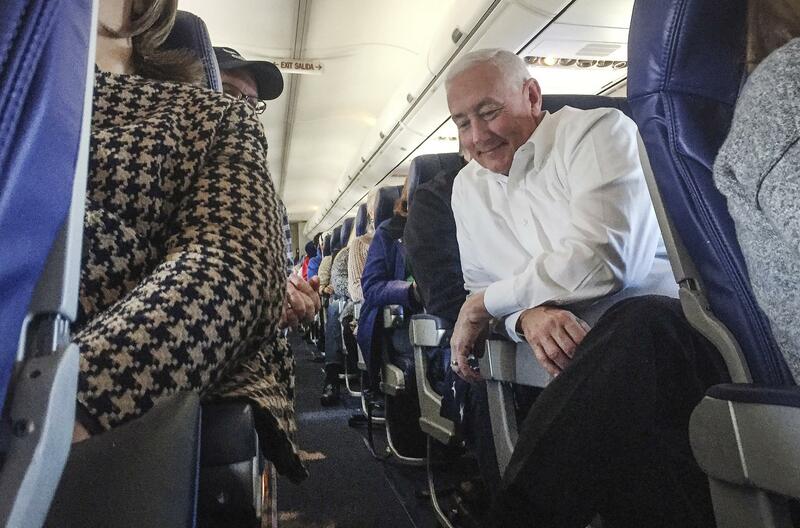 Bob Grand, a major Republican fundraiser and powerbroker in Indiana politics, told the Associated Press that Greg Pence is an ideal candidate. Greg Pence lives in Columbus, Indiana. That’s the same town the family grew up in after the Pence’s father, Edward, relocated from Chicago and later built a gas station empire. He eventually took over the company, Kiel Brothers Oil Co., from his father. But the business, which operated a chain of convenience stores under the name Tobacco Road, went bankrupt under Greg Pence’s watch in 2004. That wiped out more than $673,000 of Mike Pence’s net worth, according to Pence’s 2006 tax filings, which he has publicly released. Jonathan Lamb, another candidate in the congressional district’s GOP primary, said Greg Pence’s entry into the race runs counter to President Donald Trump’s campaign pledge to drain the swamp. Lamb, who is a businessman, also questioned the wisdom of sending someone whose company went bankrupt to Congress. “I think we’re all proud to have a Hoosier that’s steps away from the president, but that doesn’t necessarily make Mike Pence’s brother qualified to be a congressman,” Lamb said. Democrats, meanwhile, were more than happy to tie Greg Pence to his brother, who championed divisive social issues while governor, including a 2015 law that critics said allowed gay people to be discriminated against. The law was later changed, but only after a national backlash and threats of a boycott. Published: Oct. 18, 2017, 10:22 a.m. Updated: Oct. 18, 2017, 4:45 p.m.